Nottingham’s melancholic metal maestros Twilight’s Embrace are set to release their long awaited debut album By Darkness Undone next month. Mastered at Priory Recording Studios by Greg Chandler (Esoteric, The Prophecy, Mourning Beloveth) and building upon the musical themes introduced in previous EPs Reflections and Traces, this release offers 58 minutes of compelling and melodic metal. 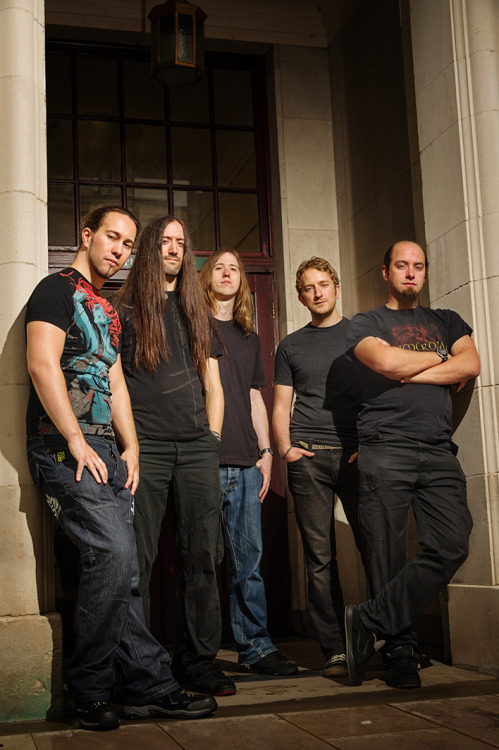 Since their live debut in 2010, Twilight’s Embrace have played venues all across the UK including notable appearances at Bloodstock and Valkyrian Festival. Compared favourably to the likes of Yorkshire Gothic-doom lords Paradise Lost and My Dying Bride, as well other names such as Swallow The Sun, Katatonia, and Insomnium, Twilight’s Embrace mix these different elements into a distinctive and cohesive whole. Showcasing a mixture of death growls and clean singing, song structures that border on the progressive, dark and introspective lyrical themes, and a wide array of melodious hooks, the result is a unique style with few parallels in the UK metal scene. Rob contacted me early on about doing this cover. He wanted a continuation of the work we did on Relentless Retribution. Kind of a complementary piece that featured the wolf in sheep’s clothing again, only this time in some sort of frozen environment. I love it, I guess he’s come to be known as ‘Wolfie’. Perfect! As the concepts for the album grew, so did the details and various elements for the album cover. For example, It started as a single lone wolf, though Rob thought it important to add his pack. I guess they’re somewhat symbolic of the band. The wolves look like they’ve come a long ways, I can relate. I don’t want to try to dictate the meaning of the cover art. Suffice to say the main elements depicted in the piece are representational of the core thoughts and themes Rob poured into the album. Solar eclipse, lunar mirage, lighting from the coming storm, the killing field , blood, death, decay…those things. Though at times this one was a struggle (thanks for your patience with me DA, VJ and NB!) the album title actually pushed it to where it needed to be. 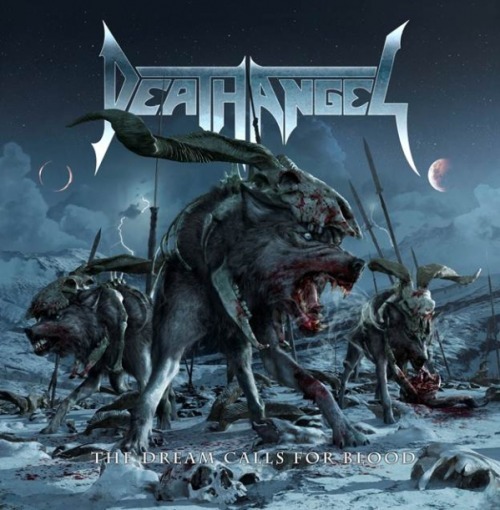 I love the title, a perfect representation of the lyrics and Death Angel in general. Once again my metal brothers have put out an album that truly captures their live energy and originality as a band. 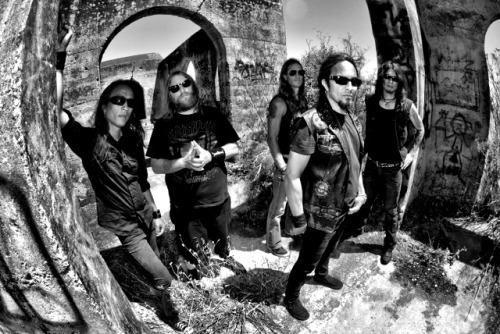 Death Angel has not only maintained their classic thrash element, but they’ve taken every aspect of what they can do as musicians to the next level – writing, playing and maintaining an intense vibe throughout all the tracks! I believe this is an album that will stand the test of time – not just for Death Angel fans, but for fans of all genres of metal. Enjoy! The Dream Calls for Blood is the wicked stepsister to our last album, Relentless Retribution – but even more cruel and sinister than her! It’s the first time we connected two records – created and produced by the same team in the same studio as ‘RR’, yet this release is more furious… probably because so much of it was written on the road. Brent did an amazing job with the cover art, again capturing the natural brutality of the hunted becoming the hunter… as territorial instinct turns into bloodlust! Down to the last detail, his art depicts a visual that matches our music and lyrics – making a complete package that we are so proud of! Can’t wait for you all to hear, see and feel it. Now we prepare to bring it live! Death Angel will be playing the Ronnie James Dio stage at Bloodstock Open Air this Friday. The new album art depicts a child, which represents innocence in humanity, covered in dirt and blood from life’s experience. In front of him is death represented by a reaper, who comes to claim his soul for the afterlife or the abyss, whichever way you want interpret what happens next. We leave it open to the fans to decide with their own beliefs. This depiction of the transition between life and death was made by Hungarian artist Peter Sallai, and will be on the standard CD jewel case and limited edition cassette tape versions. Waiting for the End to Come was recorded by guitarist Jean Francois Dagenais and mixed by Zeuss (Suffocation, Hatebreed, Arsis). 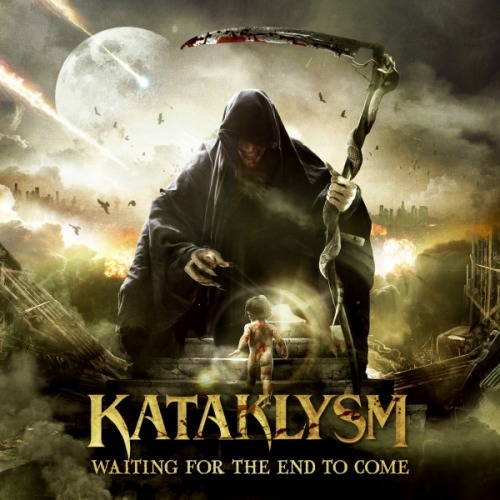 Kataklysm are performing this weekend at the UK’s biggest independent metal festival, Bloodstock Open Air, at Catton Hall, Derby. Kataklysm will be playing on Saturday on the Ronnie James Dio Stage. Manchester’s top melodic metal act Incassum have been confirmed for this year’s Bloodstock where they’ll play the Jagermeister Acoustic Stage at 6:40pm on Saturday 10th August. Incassum have also announced their first dates for the winter of 2013 including a special Hallowe’en show in their hometown of Manchester with Evil Scarecrow. As well as Bloodstock and the Winter shows, the band also has a small number of other summer festival appearances. The schedule so far is as follows, with plenty more dates to be added….